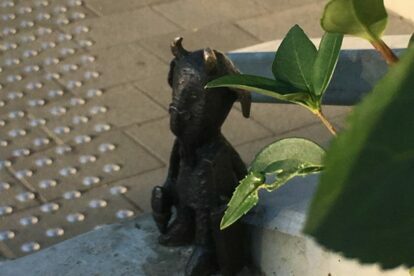 The statue of a tiny anthropomorphic goat stands on an obscure corner of Széll Kálmán tér. It depicts Mekk Elek, a beloved figure from an old Hungarian animated series, an unscrupulous jack-of-all-trades who always botches the job. It was placed there guerilla-style by Ukrainian sculptor Mihajlo Kolodko, who has also hidden several other small statues in various parts of Budapest. Mekk Elek’s location was well-chosen: the character’s creator, puppet designer Iván Koós, used to live in a house overlooking the square. The statue first appeared without fanfare in early June 2018, and was stolen a month later, but replaced with an identical one in a few weeks. If you’d like to find the statue on your own, don’t read on! If you need help, here’s how to find him: walk around the Széll Kálmán tér metro station building until you see a short underpass for trams. To the left of it, there’s a bike lane. Follow the bike lane away from the underpass until you get to a pedestrian crossing and a flight of stairs leading up. Mekk Elek is standing at the bottom end of the stairs’ handrail.